I just made up a very simple, very basic dress and bonnet pattern for mini Ddung dolls, and I wanted to share. These patterns will work great with felt, as you won't have to hem anything. Just sew and go! They would also be great as bases to make more detailed clothing from. Feel free to use or alter these patterns as much as you'd like! If you make something with my patterns, please share photos! Note: If you plan to use fabric that requires hemming, please add a bit of extra fabric to each part of the pattern so you have enough to fold. Cut out the circles for arm holes. Fasten the dress in the back with velcro strips. Cut the correct number of pieces and sew the rounded edge of the circular piece, to one side of the bar piece. Do the same for the other side and trim the sides/back to your preference. Here is an example of the finished basic pieces. Add ribbon, flowers, animal ears, patches and whatever else you can think of! 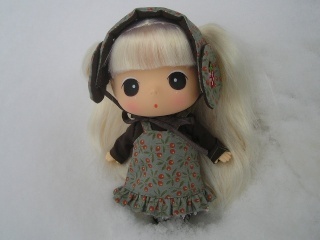 Re: Free basic dress and bonnet patterns for Mini Ddung dolls. Wow, that looks like something even I could do. Thanks for sharing! Thanks for sharing, it looks very cute! How odd that you can't see them. where the images should be. That was helpful! I think I've fixed it. Have I fixed it? Thanks!! Huh, that's strange. Chiepoo, I can send you the images if its still not working. Just let me know. Thanks for the offer, Original. If you post another pattern and the images aren't working, I will take you up on that ^_^ Also, did you paint her shoes? If so, what did you use? I like the way they match the dress. I did! I actually used nail polish. And the great thing is because the shoes are such soft plastic, the paint pries right off when you're tired of it and they can be re-painted with another color.